Palm Beach County is a county located in the state of Florida, directly north of Broward County. As of the 2010 census, the population was 1,320,134, making it the third-most populous county in Florida. The largest city and county seat is West Palm Beach. Named after one of its oldest settlements, Palm Beach, the county was established in 1909, after being split from Dade County. The county's modern-day boundaries were established in 1963. Palm Beach County is one of the three counties in South Florida and is part of the Miami metropolitan area, which was home to an estimated 6,012,331 people at the 2015 census. The area had been increasing in population since the late 19th century, with the incorporation of West Palm Beach in 1894 and after Henry Flagler extended the Florida East Coast Railway and built the Royal Poinciana Hotel, The Breakers, and Whitehall. In 1928, the Okeechobee hurricane struck West Palm Beach and caused thousands of deaths. Since then, a number of other tropical cyclones have impacted the area. More recently, the county acquired national attention during the 2000 presidential election, when a controversial recount occurred. As of 2004, Palm Beach County is Florida's wealthiest county, with a per capita personal income of $44,518. It leads the state in agricultural productivity, agriculture is Palm Beach County's 2nd largest industry. Approximately 10,200 years ago, Native Americans began migrating into Florida. The tribes settling in modern-day Palm Beach County included the Ais', Calusas, Jaegas, Mayaimis, and Tequestas. An estimated 20,000 Native Americans lived in South Florida when the Spanish arrived. Their population diminished significantly by the 18th century, due to warfare, enslavement, and diseases from Europe. In 1513, Juan Ponce de León, who led a European expedition to Florida earlier that year, became the first non-Native American to reach Palm Beach County, after landing in the modern day Jupiter area. Among the first non-Native American residents were African Americans, many of whom were former slaves or immediate descendants of former slaves who had escaped to Florida from slave plantations located in Alabama, Georgia, and South Carolina. Runaway African slaves started coming to what was then Spanish Florida in the late 17th century and they found refuge among the Seminole Native Americans. During the Seminole Wars, these African-American slaves fought with the Seminoles against White settlers and bounty hunters. Portions of the Second Seminole War occurred in Palm Beach County, including the Battle of Jupiter Inlet in 1838. The oldest surviving structure, the Jupiter Lighthouse, was built in 1860, after receiving authorization to the land from President Franklin Pierce in 1854. During the American Civil War, Florida was a member of the Confederate States of America. To aid the cause of their state, Augustus O. Lang and James Paine removed the lighting mechanism, dimming the lighthouse and assisting their blockade runners. Lang was also the first white settler in Palm Beach County. He built a palmetto shack along the eastern shore of Lake Worth in 1863 after abandoning the cause of the Confederacy. After the Civil War ended, the Jupiter Lighthouse was re-lit in 1866. Thirteen years later, a National Weather Service office was established at the lighthouse complex. However, the office was moved to Miami after that city's population began to rapidly grow. In October 1873, a hurricane caused a shipwreck between Biscayne Bay and the New River. The crew survived, but nearly died due to starvation because of the desolation of the area. An Act of Congress on June 20, 1874, resulted in the establishment of five houses of Houses of Refuge along the east coast of Florida from the Fort Pierce Inlet southward to Biscayne Bay. Orange Grove House of Refuge No. 3 was built near Delray Beach in 1876. Henry Flagler, who was instrumental in the county's development in the late 19th century and early 20th century, first visited in 1892, describing the area as a "veritable paradise." Flagler subsequently purchased land on both sides of Lake Worth. Other investors followed suit, causing a small boom and bringing in existing businesses or new ones were established. 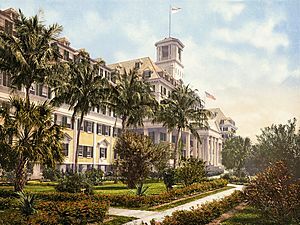 The Royal Poinciana Hotel, constructed by Flagler to accommodate wealthy tourists, opened for business in February 1894. About a month later, the Florida East Coast Railway, owned by Flagler, reached West Palm Beach. On November 5, 1894, Palm Beach County's oldest city, West Palm Beach, was incorporated. In 1896, another hotel built by Flagler was opened, the Palm Beach Inn, later renamed the The Breakers. He also constructed his own winter home beginning in 1900; he and his wife moved in on February 6, 1902. Flagler died there on May 20, 1913, after falling down a flight of marble stairs. Palm Beach County was created in 1909. It was named for its first settled community, Palm Beach. The County was carved out of what was then the northern portion of Dade County, comprising part of the areas now occupied by Okeechobee and Broward counties, part of Martin and all of Palm Beach county, initially including all of Lake Okeechobee. 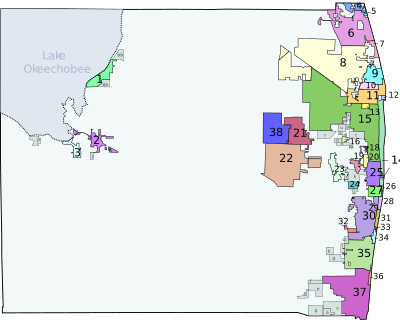 The southernmost part of Palm Beach County was separated to create the northern portion of Broward County in 1915, the northwestern portion became part of Okeechobee County 1917 and southern Martin County was created from northernmost Palm Beach County in 1925. 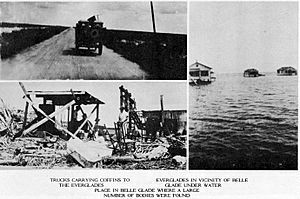 Early on September 17, 1928, the Okeechobee hurricane made landfall near West Palm Beach and crossed Lake Okeechobee shortly thereafter. Storm surge left severe damage in the city of Palm Beach, and a death toll of 26. In West Palm Beach, more than 1,711 homes were destroyed. Further inland, wind-driven storm surge in Lake Okeechobee inundated adjacent communities, particularly Belle Glade, Pahokee, and South Bay. Hundreds of square miles were flooded, including some areas with up to 20 feet (6.1 m) of water. Numerous houses were swept away and damaged after crashing into other obstacles. Flood waters did not completely subside for several weeks. At least 2,500 deaths occurred, many of whom were black migrant farmers. Damage in South Florida totaled approximately $25 million (1928 USD). In response to the storm, the Herbert Hoover Dike was constructed to prevent a similar disaster. Previously, Lake Okeechobee overflowed in 1926 during the Miami hurricane, though flooding was primarily in Moore Haven in Glades County. As a result of both the Okeechobee and Miami hurricanes, Palm Beach County, along with the rest of South Florida, began suffering economic turmoil and pushed the region into the Great Depression, even before the Wall Street Crash of 1929. Housing prices dropped dramatically in the county, as well as in the rest of the country. The Palm Beach International Airport (PBIA), then known as Morrison's Field, opened in 1936. After the United States entered World War II, it was converted to an Air Force Base in 1942. During the war, thousands of servicemen arrived in Palm Beach County for training and supporting the war effort. Following the conclusion of World War II, a number of veterans returned to the area for work, vacation, or retirement. The base was closed and became a commercial airport again in 1962. Migration to the county by workers, tourists, and retirees continued into the 21st century. August 28, 1949, a Category 4 hurricane struck West Palm Beach with maximum sustained winds of 150 mph (240 km/h) causing considerable damage. The area's first television station, WIRK-TV Channel 21, signed on September 13, 1953. It went off the air less than three years later. However, NBC affiliate WPTV-TV and CBS affiliate WPEC first aired in 1954 and 1955, respectively – both of which are still in existence today. Richard Paul Pavlick nearly attempted to assassinate then President-elect John F. Kennedy in Palm Beach in December 1960. The Kennedys were vacationing at La Guerida, a house originally owned by Rodman Wanamaker and sold to Joseph P. Kennedy, Sr. in 1933. Pavlick's anti-Catholic and anti-government views led him to stalk and plot to kill JFK. A resident of New Hampshire, Pavlick loaded-up his car with sticks of dynamite and drove down to Palm Beach. Pavlick sent bizarre postcards to his hometown, which included information that coincided with the Kennedys vacation. The postmaster alerted the Secret Service to be vigilant for Pavlick's vehicle. On December 11, as Kennedy was preparing to leave for Mass, Pavlick forwent his attempt to murder Kennedy because he was with his wife, Jacqueline, and their two children. On December 15, Pavlick's car, which had sticks of dynamite inside, was surrounded by police and he was arrested. Charges against Pavolick were dropped on December 2, 1963, 10 days after Kennedy was assassinated in Dallas, Texas. Additionally, a secret blast shelter built on Peanut Island during his presidency because escalating Cold War tensions. About three-quarters of Lake Okeechobee was removed from Palm Beach County in 1963 and divided up among Glades, Hendry, Martin and Okeechobee counties. This was the final change to the county's boundaries. Hurricane David struck near West Palm Beach late on September 3, 1979, with sustained winds of 100 mph (155 km/h). The storm's winds shattered windows in stores near the coast and caused property damage, including blowing the frame off the Palm Beach Jai Alai and downing the 186-foot (57-m) WJNO AM radio tower in West Palm Beach into the Intracoastal Waterway. A few roofs were torn off, and numerous buildings were flooded from over 6 inches (150 mm) of rainfall. Damage in the county reached $30 million (1979 USD), most of which was incurred to agriculture. The county became the center of controversy during presidential election on November 7, 2000. 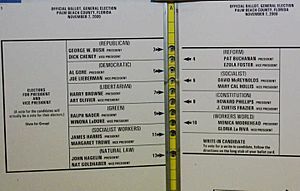 Allegedly, the "butterfly ballot", designed by Palm Beach County Supervisor of Elections Theresa LePore, led to an unexpectedly large number of votes for Reform Party candidate Pat Buchanan, rather than for Democrat Al Gore. Due to the aforementioned "butterfly ballot" and the closeness of the statewide results between Gore and Texas Governor George W. Bush, manual recounts were conducted. On December 8, The Florida Supreme Court voted 4-3 to mandate manual recounts in all counties with disputed results. However, the Supreme Court of the United States overturned the decision in Bush v. Gore on December 12, allowing Florida Secretary of the State Katherine Harris to award the 25 electoral votes to Bush, as Harris's tally prior to the state-ordered recounts placed him ahead of Gore by 537 popular votes. In turn, this gave Bush victory in the national election. Following the September 11 attacks in 2001, an FBI investigation revealed that 12 of the 19 terrorists trained or resided in Palm Beach County during the months prior to the attacks, including Ahmed al-Ghamdi, Ahmed al-Haznawi, Marwan al-Shehhi, Waleed and Wail Alshehri, Satam al-Suqami, Mohamed Atta, and Ziad Jarrah. Later that month, during the anthrax attacks, a letter containing spores of this substance was mailed to the American Media, Inc. building in Boca Raton. Three people were exposed to the anthrax, including Robert Stevens, a photo editor who died after an infection induced by the anthrax. Palm Beach County was impacted by several tropical cyclones in 2004 and 2005, most severely by hurricanes Frances, Jeanne, and Wilma, which resulted in at least a few billion dollars in damage. 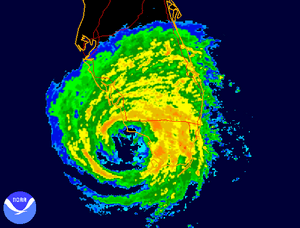 Early on September 5, 2004, Frances made landfall in Martin County as a Category 2 hurricane with winds of 105 mph (165 km/h). Although the county recorded tropical storm-force winds, a wind gust of 91 mph (146 km/h) was observed at the Jupiter Inlet. The strong winds caused about 659,000 power outages, according to Florida Power & Light (FPL). Structural damage in Palm Beach County included 15,000 houses and 2,400 businesses. Additionally, crops suffered severely, with $70 million (2004 USD) in damage dealt to sugar cane. Six deaths occurred in Palm Beach County due to storm-related vehicle accidents or drownings. 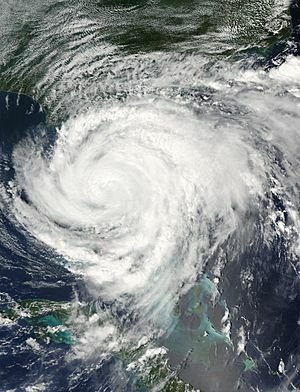 About three weeks after Frances, Hurricane Jeanne struck near the same location as a Category 3 hurricane with winds of 120 mph (195 km/h). Despite Jeanne being more intense than Frances, the overall impact was slightly lesser. Storm surge of 2 to 4 ft (0.61 to 1.22 m) along the coast resulted in moderate beach erosion in Palm Beach County. Jeanne also brought strong winds, with a wind gust of 94 mph (151 km/h) recorded at the C-MAN station at the Lake Worth pier. Unofficially, a wind gust of 125 mph (201 km/h) was observed in West Palm Beach. FPL reported 591,300 electrical outages in the county after Jeanne. About 4,160 homes were damaged and 60 were destroyed. Severe local flooding occurred in Jupiter, Palm Beach Gardens, and rural areas of western Palm Beach County. Agricultural losses reached about $30 million. Overall, Jeanne wrought $260 million in damage, but caused no deaths. On October 24, 2005, Hurricane Wilma made landfall near Cape Romano, Florida, as a Category 3 hurricane with winds of 120 mph (195 km/h). The storm headed northwestward and moved directly across Palm Beach County. At PBIA, sustained winds reached 82 mph (132 km/h), while a wind gust as strong as 101 mph (163 km/h) was observed. Winds damaged 52,385 Palm Beach County homes and destroyed 2,669 others. Since Hurricane Wilma in 2005, several other tropical cyclones have impacted Palm Beach County. In August 2008, Tropical Storm Fay brought generally minor flooding, with 7 to 9 in (180 to 230 mm) of rain over the eastern portions of the county. Fay spawned an EF2 over Wellington, which deroofed stables and knocked over electrical poles and several trees at the Palm Beach Equine Clinic. Additionally, the Equine Veterinary lost more than 95% of its roof tiles and a heavy trailer was tossed about 120 ft (37 m) from its original location. An apartment building also suffered minor roof damage. About four years later, in August 2012, the outerbands of Hurricane Isaac dropped at least 15.86 in (403 mm) of rain near Lion Country Safari. The consequent flooding left neighborhoods, in The Acreage, Loxahatchee, Royal Palm Beach and Wellington, stranded for up to several days. One man died after crashing into a concrete wall along Interstate 95 during the storm. Overall, damage in the county totaled approximately $71.59 million (2012 USD). The coconut palm, Cocos nucifera, is not native to Florida (nor anywhere else in the United States). Its presence in what is today Palm Beach County is due to the shipwreck of the Spanish ship Providencia in 1878, near today's Mar-a-Lago. It was traveling from Havana to Cádiz, Spain with a cargo of coconuts. The shipwreck was within walking distance of the shore — the Florida State Archives conserves a picture — and a deliberate grounding so as to obtain an insurance payout has been proposed. The coconuts were salvaged, too many to be eaten, and thousands were planted. A lush grove of palm trees soon grew on what was later named Palm Beach. View of Lake Okeechobee from Pahokee. According to the U.S. Census Bureau, the county has a total area of 2,383 square miles (6,170 km2), of which 1,970 square miles (5,100 km2) is land and 413 square miles (1,070 km2) (17.3%) is water. It is the second-largest county in Florida by land area and third-largest by total area. Much of the water is the Atlantic Ocean and Lake Okeechobee. The county has approximately 526,000 acres (213,000 ha) of farmland. DuPuis Management Area, a 21,875 acres (8,852 ha) area of protected lands. J.W. Corbett Wildlife Management Area, a 60,348 acres (24,422 ha) area of protected lands. Jupiter Ridge Natural Area, a 271 acres (110 ha) preserve in Jupiter, Florida. Juno Dunes Natural Area, a 576 acres (233 ha) preserve in Juno Beach. Frenchman's Forest Natural Area, a 158 acres (64 ha) preserve in Palm Beach Gardens. Sweetbay Natural Area, a 1,094 acres (443 ha) preserve in Palm Beach Gardens. Royal Palm Beach Pines Natural Area, a 773 acres (313 ha) preserve in Royal Palm Beach. Hypoluxo Scrub Natural Area, a 97 acres (39 ha) preserve in Hypoluxo. Rosemary Scrub Natural Area, a 14 acres (5.7 ha) preserve in Boynton Beach. Seacrest Scrub Natural Area, a 54 acres (22 ha) preserve in Boynton Beach. Delray Oaks Natural Area a 25 acres (10 ha) prairie and xeric hammock preserve with a small strand swamp and areas of flatwoods in Delray Beach. Leon M. Weekes Environmental Preserve, a 12 acres (4.9 ha) preserve in Delray Beach. In addition the county has many coral reef patches along its coastline. The county has put in a lot of effort to preserve the reefs. As of 2010, Haitians made up the largest population of immigrants, with Cuban exiled refugees coming in second, Mexicans in third, followed by Colombians in fourth place, then Jamaicans, Guatemalans, Canadians, Hondurans, ninth being Peruvians, and Brazilians being the tenth highest group of expatriates. British, Germans, and Polish, which had held spots in Palm Beach County's top 10 immigrant list of 2000, dropped off the 2010 list, which now no longer has any European countries in its top ten. There were 664,594 households out of which 24.35% had children under the age of 18 living with them, 46.28% were married couples living together, 11.68% had a female householder with no husband present, and 37.40% were non-families. 30.11% of all households were made up of individuals and 14.70% (4.02% male and 10.68% female) had someone living alone who was 65 years of age or older. The average household size was 2.39 and the average family size was 2.97. The age distribution is 20.4% under the age of 18, 8.0% from 18 to 24, 23.7% from 25 to 44, 26.4% from 45 to 64, and 21.6% who were 65 years of age or older. The median age was 43.5 years. For every 100 females there were 93.8 males. For every 100 females age 18 and over, there were 91.3 males. In 2010, 22.3% of the county's population was foreign born, with 43.7% being naturalized American citizens. Of foreign-born residents, 71.3% were born in Latin America, 13.6% were born in Europe, 9.2% born in Asia, 4.0% in North America, 1.8% born in Africa, and 0.1% were born in Oceania. As of 2010, 73.13% of all residents spoke English as a primary language, while 15.69% spoke Spanish, 4.03% French Creole (mainly Haitian Creole,) 1.06% French, 0.94% Portuguese, and 0.54% of the population spoke Italian. In total, 26.87% spoke languages other than English as their mother language. For 2010 the median income for a household in the county was $53,242, and the median income for a family was $64,445. Males had a median income of $44,324 versus $37,337 for females. The per capita income for the county was $33,610. About 8.6% of families and 12.2% of the population were below the poverty line, including 18.5% of those under age 18 and 7.7% of those aged 65 or over. An advocacy group has criticized Palm Beach County's roadways for being dangerous for non-motorized users. Local municipalities are working to increase safety, but county and state authorities have been hesitant to modify designs. I-95 and Florida's Turnpike are controlled-access expressways that serve Palm Beach county. Southern Boulevard (signed SR 80/US 98), which runs east–west through central Palm Beach County, is a partial freeway from Interstate 95 in West Palm Beach to US 441/SR 7 in Wellington and Royal Palm Beach. In the late 1980s, there were plans to construct two additional expressways in Palm Beach County. One was to be an 11.5 miles (18.5 km) toll freeway from Royal Palm Beach to downtown West Palm Beach. It would have run between Belvedere Road and Okeechobee Boulevard; necessitating the destruction of several homes and churches along its path. The other proposed route was a northern extension of the Sawgrass Expressway which was to be called "University Parkway". The University Parkway would have snaked around suburban developments west of Boca Raton, Delray Beach, and Boynton Beach; its path bordering the Loxahatchee National Wildlife Refuge. Ultimately, both expressways were canceled due to opposition from county residents. Tri-Rail runs along eastern Palm Beach county, adjacent to Interstate 95 for most of its length. It has stops in Boca Raton, Delray Beach, Boynton Beach, Lake Worth, West Palm Beach, and Mangonia Park. PalmTran provides bus service throughout Palm Beach county. The Port of Palm Beach is located in Riviera Beach, where Celebration Cruise Line operates 2-day cruises to the Bahamas. The Lake Okeechobee Scenic Trail, a segment of the Florida National Scenic Trail, passes through the County. The largest city and county seat is West Palm Beach, with an estimated population of over 105,000. Additionally, the approximate urban population is 250,000, when including adjacent unincorporated neighborhoods. 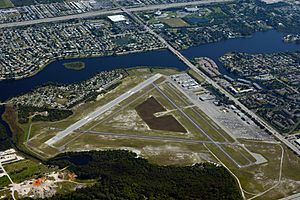 Boca Raton (South County), is the second largest, having a population approaching 90,000. 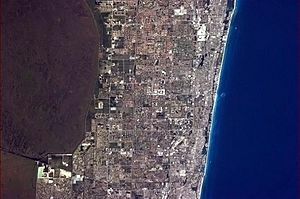 Boynton Beach (South County), is the third largest city, with a population nearing 70,000 residents. The county has 38 municipalities in total. The municipalities are numbered corresponding to the attached image. Municipality populations are based on the 2010 Census. Palm Beach County, Florida Facts for Kids. Kiddle Encyclopedia.